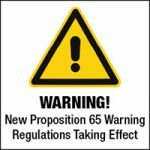 “Prop 65 appears to place the burden on the manufacturer to warn of possible exposure. Failure to do so could result in exposure to litigation and require the company to prove that the intended use of its products poses no significant risk of exposure to a single chemical on an ever-expanding list of chemicals. Because of this, Sy-Klone will now include the required ‘clear and reasonable’ warning label which will now appear on all of our packaging,” states Moredock. Sy-Klone International strongly believes that our products pose no significant risk of exposure to any harmful chemical. However, Sy-Klone has chosen–like many of our industry colleagues and like most other consumer product industries–to protect itself from costly litigation.